Platform shoes, jumpsuits, bell bottoms, big wigs, disco balls. What's your best John Travolta impersonation? If it involves any of these--and even if it doesn't but you love the 1970s, disco or running--you'll want to make your way to Lincoln Park's Diversey Harbor on Saturday morning for the Disco Dash 5K. But what makes this race extra special is its reason for existence, a.k.a. its beneficiary The Peapod Project, which provides special memory keepsake packages for families at Children's Memorial Hospital who are about to lose a young child. The Peapod Project was founded by Ted and Annette Stenstrom who lost their little girl Moreland Grace, affectionately known as Gigi, when she was only 16 days old due to complications from her inability to breathe on her own. In those 16 days, the Stenstroms tried to pack in as many memories as they could so Gigi wouldn't be forgotten. They took photos, introduced her to friends and family, made footprints and handprints, all those memories that get packed away in a baby book. Knowing that they weren't alone in a loss of this magnitude, they created this program that would essentially provide these memory-making moments to other families. 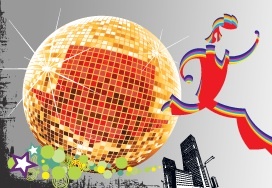 So if you want to run, support a cause that's a little different from the other charities you've likely been asked to fundraise for this summer (nothing against them), or just party in the park, you'll want to come out to Disco Dash. The race starts at 9 a.m., but the fun keeps going until 3 p.m. with music, refreshments, a raffle and more. Definitely not a bad way to spend a Saturday whether you're alone or looking for a reason to be outside with the family. Want to learn more about this event? Check it all out at the Disco Dash website--and then get running. Photo grabbed from Disco Dash.